The worst parts of “The Defector” are what it inherits from “The Enemy”. I mean that very sincerely in a number of different ways. This is another story dealing explicitly with Romulan culture and politics in an era of heightened tension with the Federation, and while it's a more than decent one of those, it is hamstrung by its attempts to wed its continuity to “The Enemy”. What this does is reveal both how much of “The Enemy” actually really was a misfire, but also the dangers of relying too much on continuity in the first place as, you know, simply ignoring “The Enemy” wasn't an option here (both in terms of common sense, as we've just done another Romulan runaround two weeks ago that I suspect most people are fonder of than I am and also because that's never something this team, who much prefer to link new episodes back to old ones if the opportunity to do so presents itself than not, ever would have done). So the Romulans are once again generically and programmatically shifty, manipulative backstabbers scheming to stir the pot just because they can. Even Commander Tomalak is back to puff out his chest and rattle his sabre at us, though don't get too used to him-Dude barely shows up again after this. And yet apart from that there's a lot of good stuff here, most notably in the character of Admiral Jarok himself, who immediately engenders our sympathy: His rank and the things we can extrapolate he did with it aside, here's someone who's been “on the ground”, so to speak, and understands firsthand the full consequences and repercussions of the Romulan Star Empire's retrograde and destructive neo-imperialism. He's the first real clue we get that Romulus isn't a monoculture and that the cartoonishly bloodthirsty jingoism of Andreas Katsulas' Tomalak does not speak for every Romulan. In fact, the folly of reducing an entire people down to crass generalizations is something of a theme, with Jarok needing to learn to trust the Enterprise crew and set-aside the in-built prejudices he's internalized from living in such a xenophobic climate. 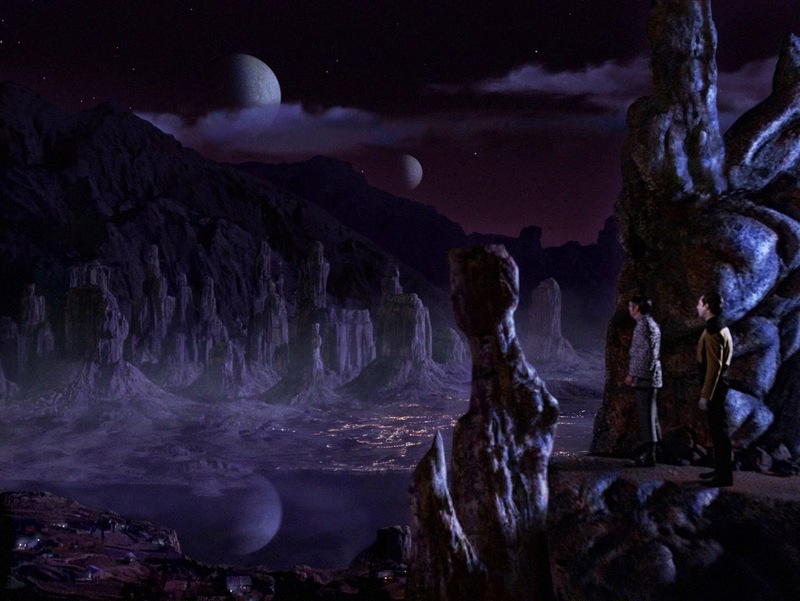 And how great is it that this all comes together in one of the single most beautiful bits of lore-building in the show to date, when Jarok poetically reminisces to Data about the Valley of Chula, which is later brought to life on the holodeck through a breathtaking bit of set design from the art department? The only concern I might raise is that Jarok becomes so sympathetic through all of this (I dare you not to get choked up when he starts talking about his daughter to Captain Picard) he actually runs the risk of upstaging the Enterprise crew at various points, which is something Michael Piller of all people should have caught. This episode does not portray the crew in the most flattering of lights, lining them up to get punched down by Jarok though having their first instinct to be to strip the scout ship (although do note how the episode pulls the genius sleight-of-hand of having Tomalak force Jarok to eat his words during the climax when he promises to do the same thing to the Enterprise: What was that about Jarok was saying about humans being inherently shortsighted, and what were we saying about the Romulan Star Empire and the Federation being the same thing?) and taking so frustratingly long to listen to what he has to say and take him seriously. I'm not sure if it's standard procedure in this sort of situation to interrogate the defector the way Riker and Troi do here, but Good Lord does that scene make them out to seem like just awful human beings. The rest of the crew don't fare a whole lot better: It's particularly bad when Data starts talking about “typical Romulan ploys”, doubly so because not only is it species essentialist, isn't *Deanna* (who gets a whopping one line again, by the way) supposed to be the expert on extraterrestrial cultures? Doctor Crusher is once again left without a ton to do, though Gates McFadden owns every scene she's in, Jarok comes perilously close to outright vilifying Worf (who at least gets to reclaim some badass points during the climax with the Klingon Birds-of-Prey). The only characters who seem remotely on level are (apart from those few awkward lines near the beginning) Data, who gets some nice moments, Picard, who you get the sense was written far more stern and taciturn and that Patrick Stewart bent over backward to take the edge off of his lines, and, thankfully Geordi: It's Geordi who's the first to trust that Jarok isn't a plant and that, while his information may or may not be strictly speaking accurate, he must have done what he did for a reason and that he's here on good faith. “The Defector” is Ron Moore's sophomore submission to Star Trek, so it's no surprise that it would have a rather more cynical and nihilistic attitude towards galactic politics than might otherwise be typical. Here we get a prototypical example of one of Moore's old standbys, equating the Federation with some other superficially nefarious group (typically with him its the Dominion, the Cardassians or the Borg, the latter of which is at least appropriate). This is ultimately just a simplified version of the kind of story D.C. Fontana has already made a name for herself telling, but the more concerning aspect this time is that Moore isn't writing for the Original Series (his apparently reoccurring belief that he is will in fact turn out to be one of his biggest drawbacks as a creative figure); he's writing for Star Trek: The Next Generation, which means it's absolutely imperative that he never lose sight of the utopian idealism and how to use it, and I frequently fear he does just that. In his blanket condemnation of the Federation, which I wholeheartedly support, by the way, Moore has to somehow spare the Enterprise crew, and I don't think he ever learns that he needs to do that or how to do it if he did. But really the most notable thing about “The Defector” is a visual change. Another thing that's new with the third season is the Enterprise itself. Over the course of Star Trek: The Next Generation, there were three official filming models made. The first was a six-foot prop that was originally intended to be the main model and was the closest to Andy Probert's original breathtaking design. This ship was used all throughout the first and second season, and can be seen in all the stock flyby footage reused across all seven seasons. Then there was a two-foot model used mainly for distance shots (you can see it in the docking scene from “11001001”, one of the stock “going to warp” sequences and in various similarly blocked scenes), and finally there was a four-foot model built especially for the third season by Mike Okuda and used to represent the Enterprise almost exclusively from then onward. The reason for the change was that the six-foot model was, well, six feet and really ungainly to work with, and the VFX team were desperate for a more manageable prop that would make their lives easier. Debuting in this episode, the four-foot model has a unique look unto itself that's somewhat difficult to put into words; it's much stockier and more compact than the original model, and it doesn't have quite the same organic elegance in its curves and ovals. I don't like it as much as I do the six-foot model, and yet it's so ubiquitous it practically defines the look-and-feel of the Michael Piller era for me. It also helps that essentially all of the merchandise based on the Enterprise with very few exceptions is based on the four-foot model, so I definitely have a nostalgic fondness for the thing. If you got PR stills of the six-foot model and four-foot models, I would feel two very, very different sets of emotions and memories wash over me depending on which one you showed me, the same as if you presented me with still photos of the cast dating to the first season and the sixth or seventh season. Somehow, my mind files it all under Star Trek: The Next Generation...and yet also maybe not. It's as if two mutually contradictory thought-spaces are competing to exist in the same place at the same time. We can talk about Ron Moore's story, but for me it will always be the aesthetics of Mike Okuda and Illusion Arts that are the most important thing here. Music, imagery and emotion are the parts of Star Trek: The Next Generation that always last with me long after the episode stops rolling. Perhaps worth mentioning then that while Ron Moore came up with the pitch for “The Defector”, the script itself was actually worked on by the entire creative team on staff at the time, and even Patrick Stewart, who came up with the Henry V framing device after the team realised they couldn't use Sherlock Holmes anymore. This leads to one of Stewart's best moments of understated genius in the show when he doubles up as Captain Picard and Michael Williams, revealing his Shakespearean theatre heritage and, in turn, his flair for working class sensibilities. And proud he should be, because that's brilliant. I also love how the surprise Klingon reveal is so cleverly built to: Picard summons Worf to the ready room in one scene for reasons we don't learn at the time, and this is followed up a little later by a blink-and-you'll-miss-it throwaway line about a message from the Bortas, and then finally that wonderful flourish at the end when a whole Klingon fleet decloaks behind the Enterprise. That entire plot only comes together from fleeting arrangements that come back in force for the grand finale. And I don't think he ever made the connection, but in talking about “The Defector” elsewhere, Piller even said this episode is something of an “echo” of “The Enemy” from two weeks back, and reading that just completely opened my eyes to a whole new world of things you can do with writing. Michael Piller was a writer who thought like a musician, and that reveals so much about why he was so perceptive and intuitive as a creator. There's nothing that works on our brains or our memories like music, and nothing more quintessentially Long 1980s than music, energy, passion and imagery resonating together to transcend to a higher state of consciousness. What Michael Piller has figured out how to do is, in a sense, write the postmodern cinematography of the Long 1980s back into *writing itself*. Which is why Star Trek: The Next Generation is such a perfect fit for Piller and why it needs him as much as he needs it. I can criticize Moore's signposts these days but I'll admit, his writing is what really drew me in. I think I always recognized that the juxtaposition of a slightly cynical long-80s, particularly-90s bent was purposefully being put up against the perceived idealism. It seems like it should be appropriate for a Romulan storyline with the original story role intact. It took them five episodes to do what "Balance of Terror" did in one, and I knew exactly what you meant when you said "The Enemy" continuity is what detracts this episode from the masters list. Well that and the continued TNG-era division of the connections between Romulans and Vulcans (the prosthetics, the sympathetic nature, the general lack of Vulcans). 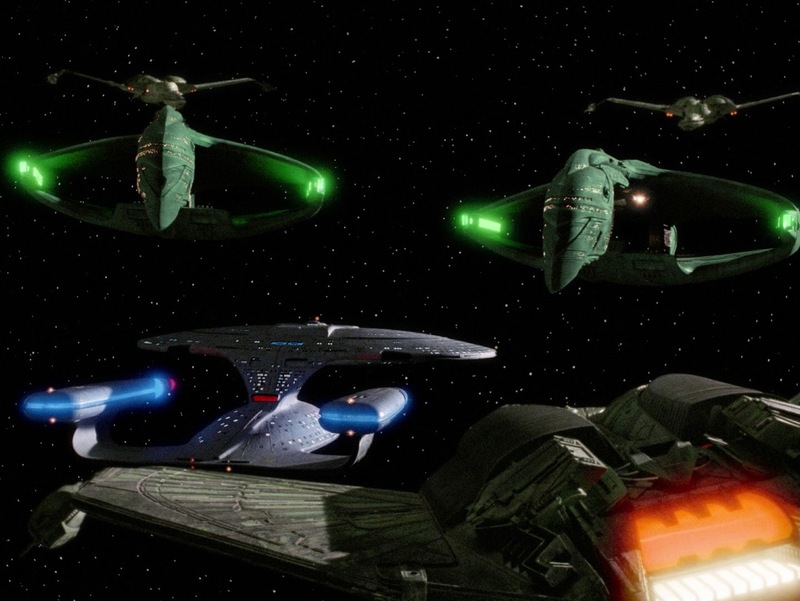 Funnily it's finally seeing Birds of Prey up against Warbirds that gets me to thinking about the symbolism of Romulan vessels now being depicted in alien green instead of ship's grey. Their vessels are the color of their blood. For humans, red is probably the most important color in symbolism and psychiatry, and its connection to blood and anima and animus have a lot of meanings. One must imagine then that for Romulans, green has the same or similar symbolism. The use of green in Warbirds is representative of passion and romantic exploration and duty and family. Of course really, it just looks cool. James Sloyan is great here. It'll be nice to see him as Mora Pol later. I'm not sure what I can dig out of this episode beyond an interest in galactic realpolitik. The Neutral Zone is already a tired concept. The Romulans will eternally be shifty now and even glimpses into how they're not a monoculture will be wasted by the fact that no proper exploration ever happens. A Romulan joining our crew ... or a Romulan-sympathetic Vulcan ... would solve these inelegant matters. There was a good chance to have an in-depth exploration of the Romulans with T'Rul on DS9, and even members of the writing staff admit that they whiffed on it. This is a lovely essay--agree wholeheartedly, and I love Piller's analogy to music (more and more I find myself thinking in musical terms for non-musical things, and it's a perspective I quite like). This is a very important episode for me--I mentioned before that I started Star Trek with the movies and later TOS, but it's really the middle school period of watching TNG reruns that I'm the most nostalgic for with the series. "Defector" wasn't my first episode--I started at the beginning with "Farpoint", but it for some reason didn't grab me, so I only caught random episodes here and there (of these "Big Goodbye" and "11001001" stick in my memory the most, though I distinctly remember a couple Pulaski episodes). 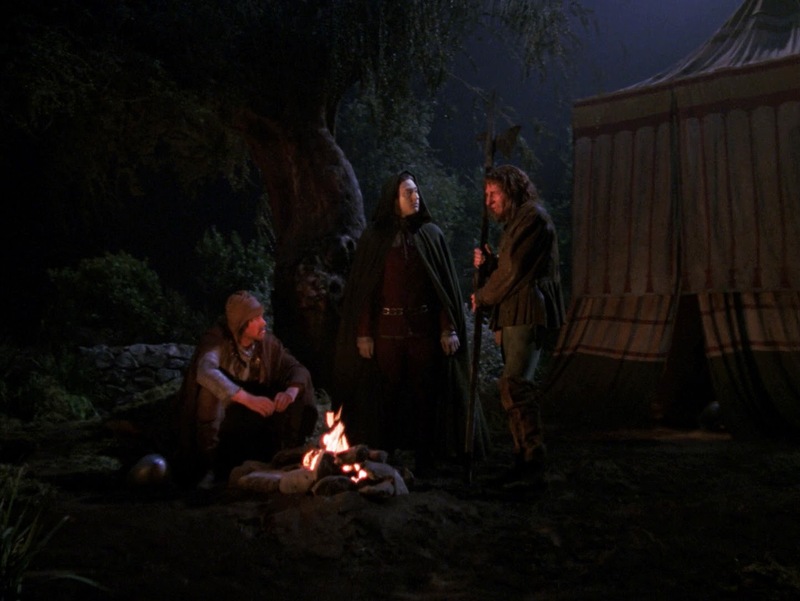 But then one night as we're flipping through channels we stumble upon Data and Picard performing Henry V, and for whatever reason this became the episode that grabbed middle-school-me enough to start watching the series regularly (I believe I saw every episode from here to I think mid-Season 6 during this period). It became a really nice daily tradition of watching the show with my sister (usually while my mom was asleep and my dad working on the computer in the back room), and even though I spent much less time with it as an adolescent than with TOS or the movies, for whatever reason this is what hangs in my mind the most when I think of Star Trek, and the reason TNG is far and away my favorite of the series.